Looking for code that will automatically equip Plunderer's Vest +3, which augments Ambush and only active when 'behind the mob'. I've tried the code below, which just tells me Ambush isn't a buff, as I was hoping it was just an invisible one not shown on the buff bar. I assume the next step is to do the opposite of the gaze lua (checks if you're facing a mob) which makes my head explode. Obviously, the angle portion would need to be modified here to make this work, to which I would make some if/then with check_facing()? I tried to do some homework, but I only have about 3 months of experience with lua coding. the rest of the lua is working fine, i was just trying to see why this specifc funtion precast wont work. It used to Auto-entrust and cast the indi bubble on my target. Hi. I tried it but still no go. I even changed the precast to pretarget(spell,action). My old lua i used did not include any mote includes and the code works fine with it. The new lua, a person on the forum was very sweet and shared with me to help a returning player. Said person suspects might be something to do with the mote include file. Hello. I got a Problem with Vitiation gloves +2/3 not working at all in gearswap. no matter how and where i put them in, gs just wont equip them. Tryed every Kind of spelling and also used Name from Export.... it just doesnt work. Anyone know how to fix that? Are you sure they aren't just getting over-ridden by something else? Can test by making a fake/test set (which includes the gloves and something else that you know works,) and equipping it directly in-game. If you name this set "sets.test", and typing "//gs equip sets.test" equips the other items and not the gloves, then you know it's actually a problem with the item. If they do get equipped, then you know it's an issue somewhere in your sets and/or logic that is causing the problem. well, I got them in 3 sets and also put them in Idle gear to be sure. they dont get equiped. If i command any set everything gets swaped in ... just not those gloves. checked in multiple other midcasts sets with //showswaps too. I'm 100% sure ist a Problem with the item. case closed. thanks alot Nyarlko! Trying to get Gearswap to work but it won't load due to the above error. Looks like im missing some files but even the latest straight from github has the same problem. Anyone know how to resolve this? 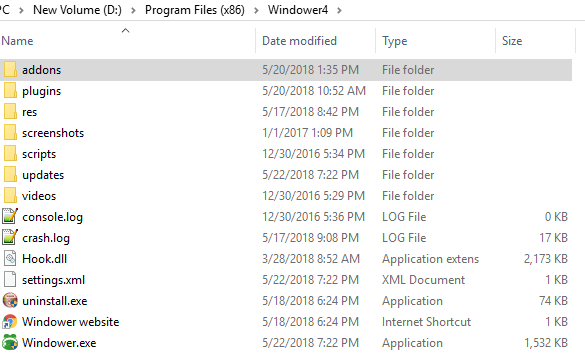 Whats your windower directory look like? Im curious as to why there is a double forward slash between Windower4 and plugins. That's generally not normal filesystem behaviour. So that could be a problem if its not some weird windower thing. I'm pretty sure it's out there somewhere but I can't find it, hoping someone here will know. I'm looking to do a "if pianissimo is on then change <me> to <t>" rule. Does anyone have that piece of lua or know how to make it? Odd. I don't know what' could possibly be wrong then. My only suggestion would be to make a backup of your configs & gearswap luas then delete & re-install gearswap. If that doesnt work then re-install windower4. Kind of a "throwing the kitchen sink" solution but.. it doesn't take long. The problem is either that you're missing important files for gearswap, or the directory is confused somehow. Basically, there's an important module for windower4 called 'packets'. Gearswap requires tapping into that module to work. Gearswap can't find that package on your machine for some reason. which either means its not there (I think this would be the less likely scenario as other plugins would likely be breaking if this file was gone) OR gearswap is in the wrong place/configured improperly/bugged out/one of a million possible issues that has caused it to be unable to locate the packets module. So yeah... re-install your stuff is probably the simplest solution to attempt. Thanks to you both :) I'll add this when I can, you've both made BRD life a lot easier. Thanks! In a friend's geo lua he's got an amazing function. When he casts let's say fire 5. Then tries to cat Fire 5 again it automatically downgrades to fire 4 and casts. I wanted to take this code and put it into my BLM lua. I cant seem to get it to work. The lua saves fine with no errors. here the function nuke downgrades is defined under user setup then the function is expanded. That's my understanding. Then again @ 503-507 , 509-553 , 800-end. he sets up 2 functions that he later expands under 509-553 and 800-end. I know i have to edit the functions include the T6 spells for BLM. Is there an easier way to implement this? I'd like to also apply in my SCH lua, so maybe you guys know of a way to replication the this option in an easier way. I mainly cast with shortcuts and with above code when its working, I just use Thunder 6 and keep pressing it again with our need to type in thunder 5. Any ideas? sorry if my question is clear ill try and expand on it more. This doesn't seem to change anything, unfortunately. And I'm not sure what it needs to fix it. I tried a few things randomly but I do not really know what I'm doing... ! I've been having a problem with GearSwap lately where it will be completely functional for a while but then suddenly, it won't allow me to perform any action where gear is checked (i.e. WS, JA, magic). I was told to try "//reload luacore" but that always crashes Windower for me. The only solution I've had is to completely shut down Windower and restart. I would say this might be a Windower problem, but when I unload GearSwap, it allows me to do everything again. No one else I know has this problem. Can anyone halp? Does this only happen on 1 job or all of your jobs? If it's only 1 job then it's probably an error in that job's lua somewhere. If it's all jobs then there's probably an issue with gearswap itself or mote-libs if you're using them... or any other shared lua file. "Won't allow me to perform any action"
Do you mean it won't swap gear, or it won't even let you cast the spell at all? Not swapping gear could just be something calling 'gs disable'. Not being able to cast spells period... that seems like a much stranger/serious issue. If that's indeed the case I would backup your personal lua files and then delete gearswap + reload it. Are there any error's, or anything in the console when this happens? That would be the first place I'd check. Currently using Kinematics SAM lua but noticed it doesn't have a Hasso set to use the hasso+ gear when hasso is on... Does anyone have something like this I could easily slot into it? but then doesn't seem to do anything with it? This seems to be working when I don't use <me> in the macro and keep it as /ma "song" without any target at the end. Huge thanks for helping :) ! Add this function. Might work. Who knows. Mostly a guess... I dont really use motelibs. I'll have to try reinstalling GS, but yeah, it's preventing all actions that could possibly trigger a gear change. Doesn't swap gear, doesn't perform the action until I unload GS. To clarify: talking to NPCs is fine, but even /shutdown when it's having this problem is not allowed, like it's stuck looking for the gear I'd rest in. Spells, abilities, etc. are prevented altogether. It lets me engage and auto-attack but doesn't swap to my engaged set. Absolutely no errors or messages in console. For some reason, my friend's BLM lua doesn't pick up Hachirin-no-obi. It works when I use it, any idea what could be the problem? Is it something with his resources? Well since you haven't provided the lua in question and told us where the obi is implemented... then my guess is... your friend re-wrote the entire lua using the wingdings font.